Tips for maintaining female beauty and health, targeted at young and active women. Tialoto.bg combines current lifestyle themes with useful information about the body and soul, cultural news, fashion trends, anti-stress programs, tips for a happy family life, recipes. 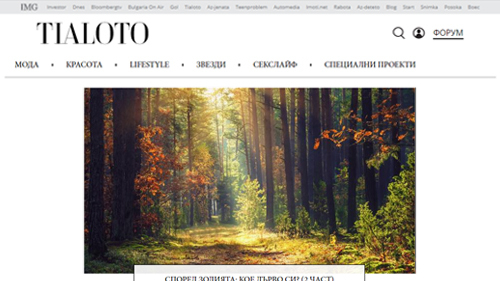 The unique style of writing and communicating with the audience makes Tialoto.bg one of the most visited and preferred lifestyle editions for every modern woman.